​After the death of Oba Ozolua (1481- 1504) a power struggle ensued between his two sons, Prince Osawe who ascended the Benin throne as Oba Esigie and his half-brother Arhuanran who was at that time ruling another powerful town Udo some 20 kilometres outside Benin City. However he ruled as a duke not a king. Idia is accredited with aiding her son to secure his claim to the throne and for providing him with ongoing support and wise counsel throughout his reign. His kingship survived because of her efforts. The story goes that since the time they were born, there existed a dispute about who was the rightful heir to the throne. According to Benin tradition, the first born son always succeeds the throne. However, two of the Oba’s wives gave birth to male sons hours apart. As per Benin tradition, the first son to cry is the senior child. Prince Arhuanran was born first by his mother, however, he did not cry out and when a few hours later Prince Osawe was born, he cried out and was reported to the king who performed proclamation rites to declare him heir to the throne. Prince Arhuanran and his mother were unhappy and continued to dispute this position of the rightful heir to the throne, claiming denial of Prince Arhuanran’s birthright. So when his father the Oba died, he made a claim to the throne. This led to a long and bloody civil war on record as one of the bloodiest wars in the kingdom’s history. The king’s mother concerned about survival of her son’s monarchical authority and of Benin kingdom, supported him to launch a full scale war on Udo. Oba Esigie won. A triumphant warrior king with soldiers, bell ringer and horner blower (these accompany the army on each campaign). ​The Udo wars led to the defeat of his rebel half-brother and extension of Benin Kingdom domain. Benin royal army built military camps (Eko) on their way to their many war campaigns which were often over long distances. Frequently on their way back from the war, some of the leaders chose to settle down in these camps and not return to Benin. From the Udo wars originated new settlements amongst them Eko (now Lagos) and Ondo. These are now Yoruba lands. A Benin soldier with a captured Yoruba king (identifiable by his facial tribal marks) on horse back being taken back to the king in Benin City. Exploiting weaknesses in the kingdom during this civil war, Igala people sent soldiers across the Benue River to colonise northern parts of Benin kingdom. A long and bloody war ensued Benin Royal troops assisted by Portuguese mercenaries defeated the Igala people (1516). 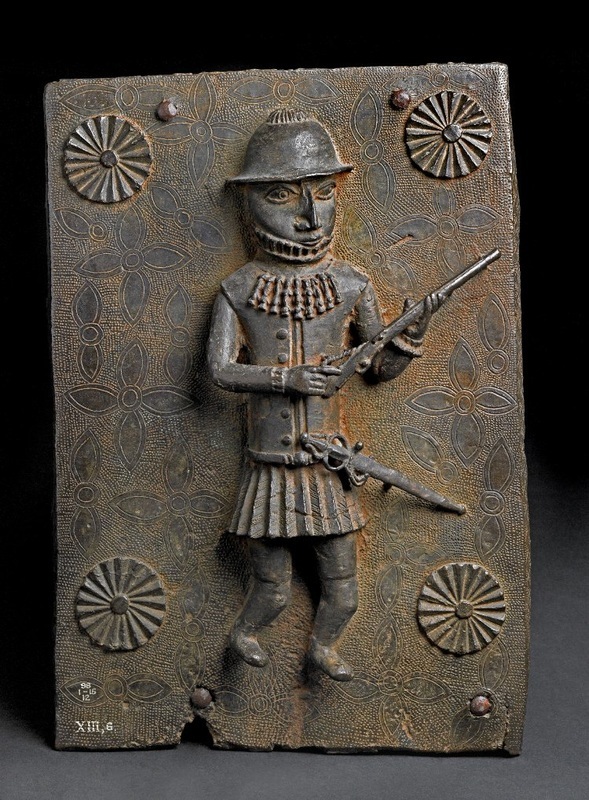 Above Portuguese mercenaries have been cast in Benin Bronze plaque. The first has his gun and a sword in scabbard. The second with his matchlock gun. 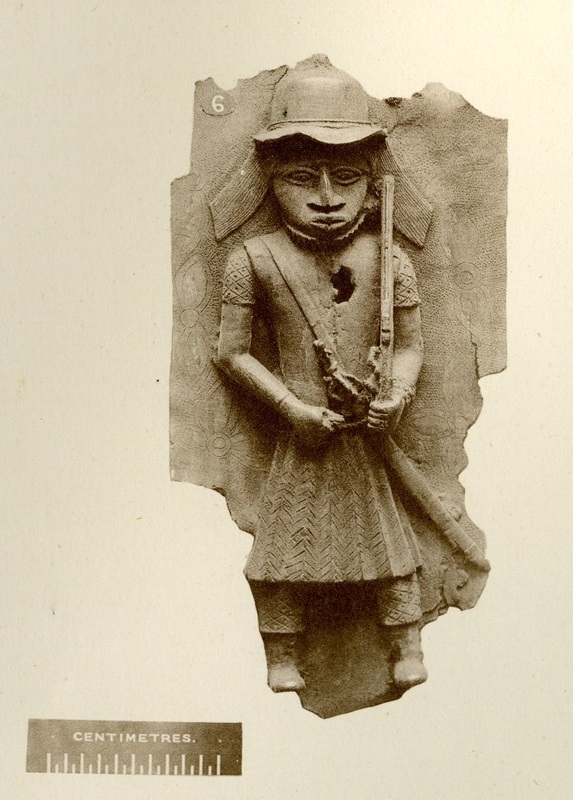 The Portuguese mercenaries trained Benin Royal army and assisted in many Benin wars. The majority of the Igala soldires were lost during the war, a handful of them managed to escape by jumping into the Benue River and swimming across. As the Benin soldiers could not swim to go after them, they got away. ​The Igala king was captured and taken to Benin amidst much celebration as shown in the plaque below. After many years of war with the Igalas, the captured king had to pledge annual tribute to Oba Esigie for the transgression. Idia is credited with using her knowledge of magical powers and medicinal knowledge to lead the troops when they fought and pursued the Igala soldiers from the kingdom. She also led and assisted in many other wars. Captured in war kings were brought back to Benin to pledge annual tribute as vassals to the kingdom. The captive kings came from right across West Africa. With security and peace in the kingdom, Oba Esigie was able to direct his attention to other matters. He expanded Benin territory. He established Christianity in the kingdom and exchanged ambassadors with the king of Portugal. He received explorers like John Affonso d'Aveiro. Oba Esigie could read and write Portuguese fluently. His heir was educated under the Portuguese education system. In honour of her support, Oba Esigie created the title of Iyoba (Queen Mother) granting her equal authority to that of a senior town chief (these chiefs help the king run the towns). He built a palace for her Eguae-Iyoba at Eselu (lower Benin). Eguae-Iyoba translates as Queen Mother city. From here, she exercised a lot of political influence in the administration of the kingdom as she had her own domain. This arrangement avoided conflict with the Oba’s authority. She had the power to nominate worthy citizens for conferment of special Queen Mother Palace titles. 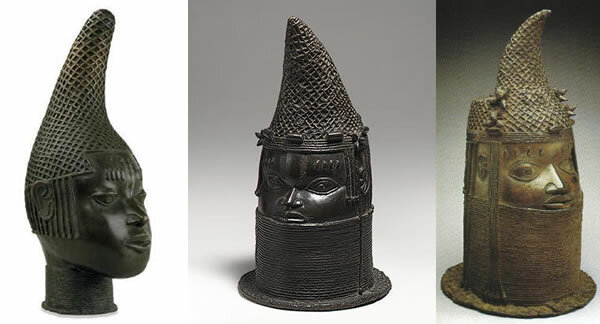 Oba Esigie commissioned a brass head which represented her to be made and placed on her alter following her death. Queen Mother Idia has remained an inspirational female role model for subsequent queen mothers and all mothers in the kingdom. In the old kingdom, Queen Mothers were viewed as special and they devoted their time entirely to raising the next king in accordance with traditions. As one of the few successful military women in world history, her place is rightfully alongside Joan of Arc (1430) , Samurai Hangaku Gozen (1201) and Boudica Celtic Britain (60AD) to name but a few. From this period onwards, shortly after the coronation of an Oba, the title of Queen mother is conferred on his mother. All Queen Mothers are buried in a special burial place in Eguae-Iyoba. All queen mothers were viewed as instrumental to the protection and well being of the Oba and ultimately of the kingdom. Note the tribal marks (tattoos) on their foreheads. Compare these with those on the Yoruba king above. A person was identified by the tribal mark on their faces. In a world where people spoke different languages, this made it easier to identify which part of the 'world' each person came from. Tribal marks also helped to identify royalty in some cultures. Today, we are able to recognise individuals from centuries ago from the tribal marks on their faces shown on artwork commissioned then by royalty and the rich.